No need to be frightened of aliens arriving by this UFO. 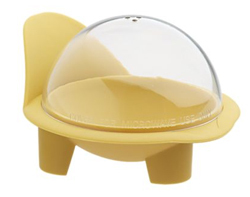 Tiny and exceedingly cute, this Egg Poacher works in either the microwave or on the stovetop. Simply crack an egg into the reservoir, cover and place in the microwave for easy no-water poached eggs. Alternatively, you can place it in a pot of boiling water, as it is heat resistant to 500 degrees. Microwave safe, and of the friendly variety.